There’s something for everyone in the city of Burnaby. If you like the outdoors, Burnaby has around 160 parks for you. This means that the city’s ratio of parkland to residents is one of the highest in North America. Enjoy shopping? There’s the Metrotown Mall, British Columbia’s largest shopping centre with more than 450 stores. Maybe you’re craving some culture. You could visit the Burnaby Village Museum situated in Deer Lake Park or check out some aboriginal art at the SFU Museum of Archeology and Ethnology. Thanks to all this, and more, Burnaby is becoming increasingly popular with property renters and buyers alike. One of the first things a potential buyer or renter looks for is curb appeal. If the front of the property is well-maintained, chances are the rest of the house is as well. Our Burnaby Roof Cleaning Service can be of great benefit. Moss growth on the roof of a property is unsightly and destructive. Your roof has enough on its plate protecting your home or business from wind, rain, snow, and the summer sun without the extra moisture moss growth brings. A home inspector will be quick to point out if moss removal is required, when inspecting the front of your property. If you are thinking of listing your home or business, our Burnaby Roof Cleaning and moss removal service is essential. Just like the rest of the lower mainland, Burnaby gets its fair share of rain at an average of 58 inches per year. Rain brings moisture which in turn breeds moss, lichen and algae. Corrosive cleaners and scraping can cause irreparable damage to a roof. 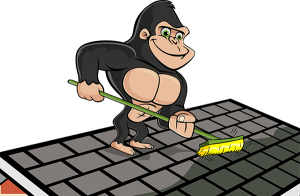 Using the safest and most effective techniques, our Gorillas will have your roof free of moss and looking its best in no time.